The nation’s highest court gave no reason on Monday for its decision to not to take the case. The ACLU had represented Wiccans Jane Felix and Buford Coone of the Order of the Cauldron of the Sage in its legal challenge against the monument, which has been on display at Bloomfield City Hall since 2011. A former city council member had proposed the monument four years prior, which was then approved by city council but paid for with private money. 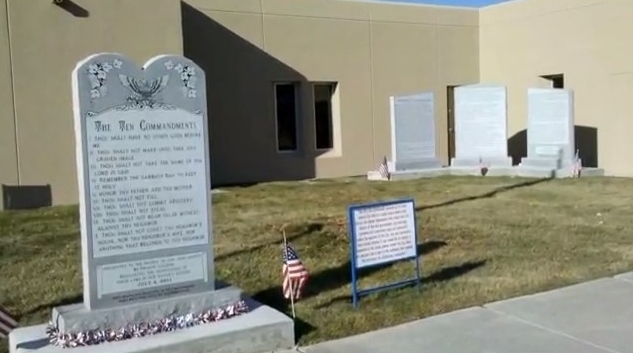 “Presented to the people of San Juan County by private citizens recognizing the significance of these laws on our nation’s history,” the Decalogue read, which was unveiled during a special ceremony. Felix and Coone said that they were offended by the monument. The city then sought an en banc, or full appeals court, review of the case, but the request was denied. More than 20 states and over 20 members of Congress had joined legal briefs to the U.S. Supreme Court, urging the nine justices to hear the case, but on Monday the court passed on the matter. Only a few appeals are accepted each year by the nation’s highest court. The religious liberties organization Alliance Defending Freedom (ADF) expressed disappointment that the case would not have the chance for an appeal. “Americans shouldn’t be forced to censor religion’s role in history simply to appease someone who is offended by it or who has a political agenda to remove all traces of religion from the public square,” remarked ADF Senior Counsel David Cortman in a statement. “In this case, the U.S. Supreme Court had the opportunity to affirm, as it recently did, that ‘an Establishment Clause violation is not made out any time a person experiences a sense of affront from the expression of contrary religious views.’ We hope the court will take advantage of a future case to resolve the confusion that reigns in the lower courts on this issue,” he said. City Attorney Ryan Lane told the Daily Times that Bloomfield will now work with the private entity that placed the monument to have it removed.